The Workbook Size optimizer for Excel can better compress data inside workbooks that use PowerPivot or PowerView if this data comes from external data sources. The best size compression can be achieved for workbooks based on SQL Server databases and there are a few tricks we can do for other SQL datasources as well. 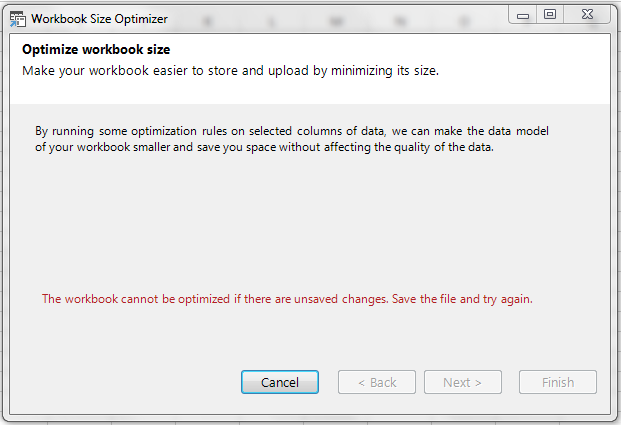 The optimizer will install as an add in to excel and will provide you with a nice wizard to better compress the size of your workbook. Using the optimizer you can often get more than 1,000,000 rows datasets in a workbook under 10 MB, share it in SharePointOnline and interact withit using the Excel Web App in any browser. Despite a testing a few models with data from Adventure Works I couldn’t get it to suggest any changes (it didn’t spot that I had imported a column containing binary data, hmmm) but I guess it needs more testing on larger/more diverse data sources. Maybe there’s a blog post coming from the PowerPivot team coming soon explaining how to use this?